As brilliant it was to beat Barcelona, Celtic cannot be sure of qualifying from the group stage in the UEFA Champions League. Nobody gave Celtic much hope when they were drawn in the same group as the Catalans, Benfica and Spartak Moscow, but with two games to go, they’ve got a great chance of getting into the last 16. But the hard work is not over – they go to Lisbon in a couple of weeks and Benfica know they have to win to recapture some of the initiative. Manager Neil Lennon has beamed with pride since Celtic beat Barca and some are heaping superlatives upon a Celtic side that has fought against the odds. Others are calling it one of, if not, the, greatest night in the club’s history. Whoa! Steady on! 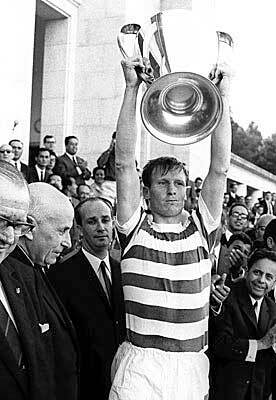 Are they not forgetting 1967 and the afternoon that the label “Lisbon Lions” was invented? There’s no doubt that Celtic 2 Barcelona 1 is right up there. True, Celtic 2012 are not the same vintage as Jock Stein’s heroic eleven, but this Barcelona can compare with some of the great teams of the past. So the current Celtic squad, which is a pale shadow of even the most recent and decent sides, can claim a very good scalp. And it’s about time Scottish football had something to sing about, if only to distract bawdy Scots from talk of independence. And to be fair, Celtic do need to be stretched and tested, especially now they are without Rangers for at least another two seasons. But nobody should be fooled in thinking that a win against Barca is the sign of “arrival” back on the European stage. Despite being named the 37th biggest club in the world, Celtic are way behind the European elite. While Barca had multi-millions of talent on their bench, Celtic brought on raw teenagers and cut-price signings from place like Aidrie. Actually, he did well – Tom Watt, who cost Celtic £50k, scored against Messi & co.
Celtic’s squad today, unlike Barca’s team of playboys with film star lifestyles, is distinctly B-movie stuff. Jock Stein assembled his squad by chucking a football into tenement Glasgow and waited to see what emerged. Lennon’s squad has been put together from “Newcastle to Nairobi” to quote one newspaper. He’s got a bargain striker called Wanamaya who cost £900k from Beerschot in Belgium and a Manchester City refugee in the form of Greek forward Samaras. Look at the CVs of the others and former clubs like Derby, Scunthorpe and Getafe are listed..
That’s not to say that Celtic have not been underdogs before. In 1967, the late Jimmy Johnstone said that the Celtic team that won the European Cup (still hard to believe, I know), was an ugly bunch of toothless ruffians, while the Inter Milan line-up that day in Lisbon was clean cut, finely coiffeurred, tanned and all resembled Italian films. Benfica are no Barcelona, although they are unbeaten in the Portuguese Primeira Liga this season with six wins from eight. Celtic will still need to rekindle that night at Parkhead….